Las Vegas, NV-June 14, 2010 - eLaw Software & Marketing plans to change the face of legal traffic representation, and the time is now. The company launched 24 Hour Ticket Power this month with an eye on changing how people handle their traffic tickets. 24 Hour Ticket Power is the first product of its kind, melding the services of a skilled legal firm with cutting edge technology to deliver a site that is surely here to stay. The site built by a collaboration of attorneys and internet business services, including Dunham Tech and Hikanoo, is now live and open to the thousands of customers that need to deal with traffic violations every day. The site truly automates the ticket adjudication process from start to finish, capturing all critical ticket data to accomplish a client's goals. The result is a site that really is inductive the Southwest Airline mentality: ease of use and a service at a price second to none. From speeding tickets to running a red light, the site delivers fair representation, often reducing fines to as little as $90 with no points or insurance increases, without spending hours in a court house line..
24 Hour Ticket Power was developed by attorneys interested in helping automate the process of legal representation. The site offers clients the ability to completely handle their traffic violation/s with a few clicks of a button. 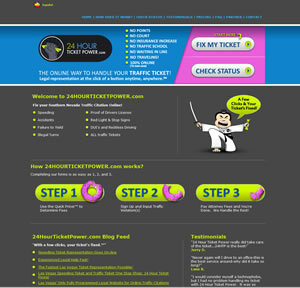 24 Hour Ticket Power is owned and operated by e-Law Software & Marketing.